I first discovered Rad Soap Company about a year ago at a Chocolate Expo of all things! They make cool, edgy, distinct soaps and creams. Rad Soap uses non-GMO food grade oils, unrefined shea butter, and natural fragrance oils in their products. They are also paraben and formaldehyde-free, so you can feel good about using their products on your skin. 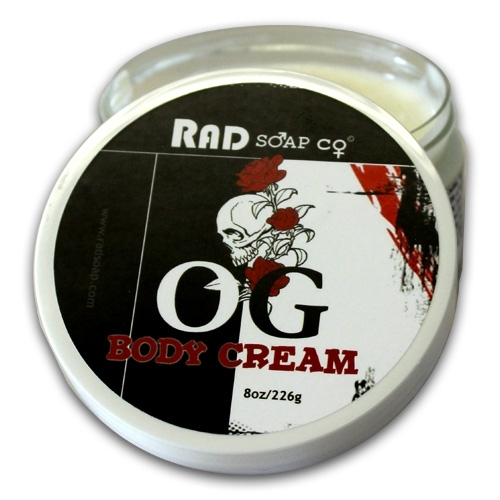 I am hooked on the Rad Soap OG Natural Body Cream. The company describes their OG Natural scent as “a lemony Mediterranean/South American scent of verbena with a touch of fig and mint added for a distinct attention.” The smell is heavenly – and addictive. The OG Natural Body Cream is enriched with antioxidants and essential fatty acids, helpful for healing dry skin and improving the texture of your skin. You only need to use a little, as it’s very nourishing – not greasy, yet extremely hydrating. There is also a matching body bar that is perfect if you like to layer your scent. The company’s soaps are handcrafted in small batches using a ‘hot process’, thereby creating an intensely moisturizing bar. I have been using both the soap and cream and my skin has stayed soft and healthy all winter. Rad Soap is great for all skin types, including sensitive skin. If soaps and skin creams just aren’t your thing, their website is chock full of other great body products like essential oils, body scrubs, lip care, and more. If you are looking for a unique body care line formulated with great ingredients that are going to treat your skin right, then look no further than Rad Soap Company! Visit radsoap.com and treat your skin to something special! Thank you for the wonderful write up Allison!